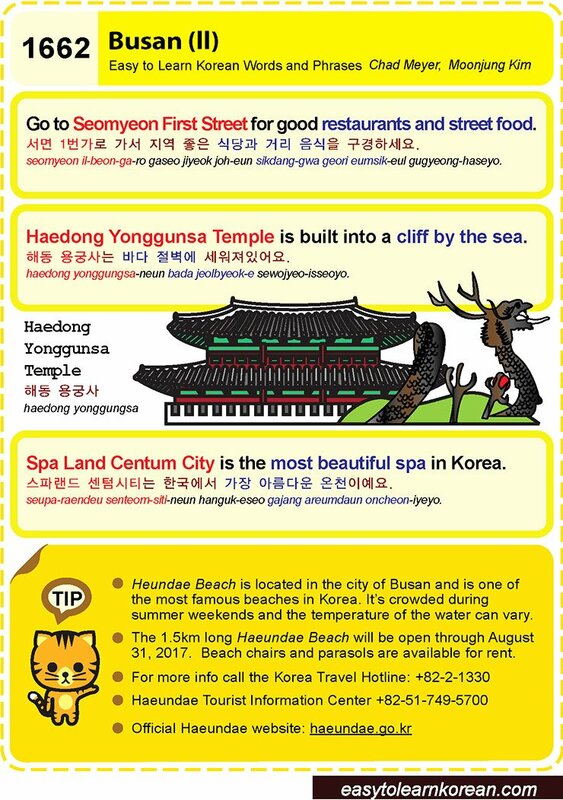 Easy to Learn Korean 1662 – Busan (part two). Posted in Series	| Tagged beach, beach chair, Busan, Go to Seomyeon First Street for good restaurants and street food., Haedong Yonggunsa Temple, Haedong Yonggunsa Temple is built into a cliff by the sea., Haeundae Beach, Haeundae Tourist Information Center, haeundae.go.kr, Korea Travel Hotline, parasol, Spa Land Centum City is the most beautiful spa in Korea., summer, 서면 1번가로 가서 지역 좋은 식당과 거리 음식을 구경하세요., 스파랜드 센트럼시티는 한국에서 가장 아름다운 온천이예요., 해동 용궁사, 해동 용궁사는 바다 절벽에 세워져있어요. It’s the summer season and the perfect time to hit the beaches. Everyone knows Busan’s Haeundae and the beaches of Jeju.